Thanksgiving is a wonderful holiday filled with family, friends, and lots of food! Whether this is the first Thanksgiving with your family or one of many, you may be looking for something new to try. 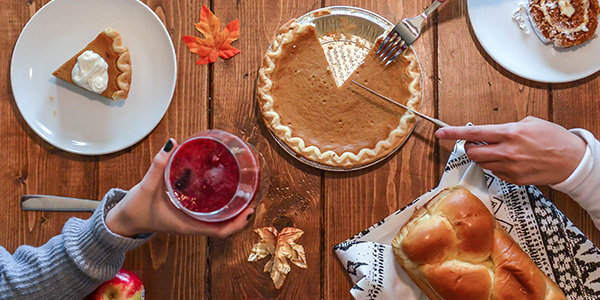 A fun way to add memories to your holiday is to begin Thanksgiving traditions. By getting your family involved, you can create special activities you do each year that everyone looks forward to. While there are many Thanksgiving traditions you can start, we came up with ten of our favorites for you to try this year. There’s something very special about waking up on Thanksgiving day and heading straight for the couch to get snuggled up in a blanket and watch the Macy’s Thanksgiving Day Parade. Even if you don’t spend the whole morning watching it, take an hour out of your morning this year to sit down with everyone and enjoy the grandeur of this classic Thanksgiving tradition. While some people swear by the fasting method on Thanksgiving morning, others treat breakfast as an excuse to eat more great food! We don’t suggest eating a heavy breakfast and spoiling your appetite for the real feast, but a delicious, light breakfast could be a great new tradition to try! If you aren’t up for breakfast the day of, consider a tradition of making a “Thanksgiving leftovers breakfast” the next day. As long as your heart isn’t set on exclusively traditional dishes for Thanksgiving, this could be a fun new tradition to try out. Each year, make a new side dish you’ve really wanted to test out. If it’s a hit, keep it for next year! If not, switch it up next Thanksgiving. Get the family involved by having them vote for what dishes they want next year or have everyone put their suggestions on a paper and pick from a hat. When you mention of all the things you are thankful for this Thanksgiving, you’ll likely say things like your home and the food on your table. Unfortunately, many people in your community will not have either this holiday season. A great tradition to start with your family is to spend part of your holiday volunteering at a homeless shelter or soup kitchen. If you are unable to do this, you could also donate some food to a canned food drive to spread kindness and give food to a family in need. If you are a football family, getting decked out to cheer for your team is a Thanksgiving tradition you never miss. Encourage your guest to ditch the formal wear and have everyone come in their jerseys and other team attire. Maybe even forego the traditional Thanksgiving décor for your team’s colors to get everyone excited. If that’s not exciting enough, you can up the stakes with bets like winning team gets first dibs on their pieces of turkey. Writing everything down helps keep a visual reminder throughout the day of the things you are grateful for. One option is to put butcher paper down on the table and write directly onto it what you are thankful for. You could also cut out construction paper leaves, have everyone write on them, and tape them to a cut-out tree. Lastly, you could have everyone write on a slip of paper, then shuffle them all up and have everyone read one slip. As everything is winding down after dinner, why not pull out a board game to play with the family? This will keep you occupied and together while you wait to get hungry enough for dessert. Plus, it’s another way to add memories and laughs to this very special day. You could either grab a board game out of your own personal stash or have someone bring a new one each year to try. There’s going to be a point in the day where all of the food finally hits and you are ready for a nap. Make it a Thanksgiving tradition to choose a go-to movie that everyone enjoys. Each year, turn on the movie when things are starting to settle down. Since you’ve already seen it, you won’t be upset if you fall asleep halfway through. This tradition will get everyone calmed down, and will likely be a favorite amongst all ages. Who doesn’t love a good nap? Kids love being put in charge of things, and dessert is a great, low key part of the meal to get them involved. Have them act as waiters and take everyone’s orders for pie and other desserts. Then, have an adult help them fill the plates and bring them out to everyone. Put someone in charge of applying the whipped cream to each pie slice. It’ll give everyone a little bit of downtime to enjoy desserts and lets the kids feel like they were a part of the big day. Last but not least, set aside the wishbone when preparing Thanksgiving dinner. When everything is cleaned up, choose two people to grab the sides of the wishbone and pull. The one who breaks off the bigger piece gets to make a wish! Do any of these sound like Thanksgiving traditions your family would like to try? Maybe these traditions have sparked an idea for you to create a brand new one on your own. However you choose to celebrate, we hope you have a relaxing day filled with friends, family, and loved ones. For help with Thanksgiving recipes and décor, head over to our Pinterest.